okay, so you should never start a new blog in the week before you're going on vacation. It takes FOREVER to get back to it! still, it feels pretty accurate-- it's been a long time since I took the long-form version of this test, but I think the result was the same back then. Anyway, much knitting continues... too much to do at work today to show pictures, but I promise to get updated and current this week. Much to show since last July!! I got my invite! I got my invite! Ah, all the Ravelry goodness! it's fantastic-- if you're not on the list, get on over there to Ravelry.com and sign up! it's just the coolest thing. And it's what I've been doing with all my time practically since the moment I got my invitation. So fun! The most time-consuming part is cataloging the stash-- taking pictures, entering specs, etc., etc. But very satisfying stuff! And I've already managed to set up a swap with another Raveler, so soon I'll have 3 lovely lovely skeins of Handmaiden Silken. Yum! For a Tuscany for my very own. In forest greens and coppery colors. Tasty. And speaking of Tuscanies... after seeing amyKnitty's swatches of the original Tuscany and two subsequent ones, I was no longer confident that mine (out of Elann Callista, a rayon, cotton, linen blend) will block out to be as lacy as it should be, so I emailed her and asked for some advice... She very kindly answered and said that because cotton and linen are tougher to block than silk, I should try to get the look I want as I knit, and that this one looks pretty tight to her. SO-- I will re-swatch on larger needles and take EZ's advice to knit more loosely (so that I don't have to find another hobby!). So that's the update on that. It's too bad, too, because I was a little further along than in this picture. So without further ado, my current projects. First, I'm showing off a little baby sweater that I just finished the other night. It has a bit of a shameful story behind it-- namely, that it has taken me this long to finish a gift for a good friend's son who was born last August!-- but now that it's done, I can't wait to go down to St. Louis and present it to her. I'm hoping that the fact that I sized it for a 2-year-old will help assuage my guilt-- it might be late, but she'll be able to use it for probably a year or so, especially since right now her son is small for his age (from what I can glean without giving away that I've been planning to make something). 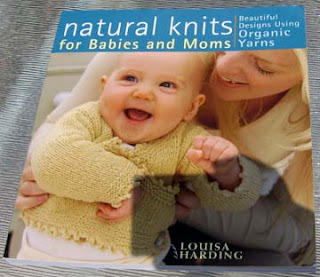 The pattern is from Natural Knits for Babies and Moms by Louisa Harding. And can you believe I found buttons in exactly that color green? I guess it's hard to tell with the reflection, but trust me, they're just right! I sewed them on so they'd be like diamonds, but now I'm wishing I'd done them flat on as squares. I guess I'm still trying to decide whether to take them off and redo them-- I hate sewing on buttons, and if I leave them, it's done! So I guess I'll have to see how I feel in the next couple of days. 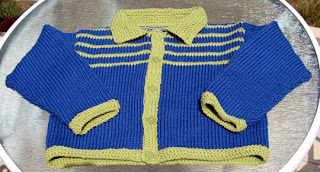 I have a little baby jacket out of self-striping sock yarn that just needs buttons and the ends to be woven in. Finishing! It's my downfall. This one's been at this point for probably 2 months! A yellow sweater with duplicate-stitched ladybugs and stripey hems for my niece, who's 5. 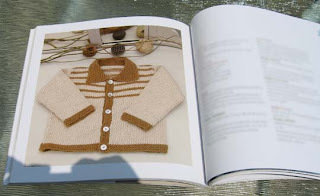 It's from Family Circle's Knits for Kids (and it's the sweater on the cover). Front and back pieces are done, but don't line up, so I have a bit of rescuing to do before I start the sleeves, which I will definitely do at the same time to avoid this type of issue! Another sweater for my niece, a rosy pink ballet (surplice) sweater out of angora/cashmere/wool yarn (recycled yarn I got on eBay-- great cash saver!). I only have the front of this one done, and if I'd known when I started it what I know now about knitting in the round (and converting patterns for same), it would have been a natural pattern to do that way. May still consider frogging that front and starting over. Plan is to also make matching leg warmers (traditional, ballerina-style ones, not the chunky kind that I'm not a big fan of, having lived through the legwarmer craze when I was in high school in the 80s). A cotton, broken-rib sweater for my nephew (2.5 years old), back piece and shoulder/elbow patches done. (I think it's from a Vogue magazine, but I'll have to look up the exact issue. Guess I haven't listed the exact patterns for any of these, but I'll surely put them up on Ravelry when I get there...) Still, I love this pattern because it's made with Peaches & Cream cotton, so the whole sweater will have cost about $8 and will be able to be washed and dried like a dishcloth. Genius! A cabled sweater for myself (!) from Knitting Simple Jackets. I love this book- there will definitely be more on this later. 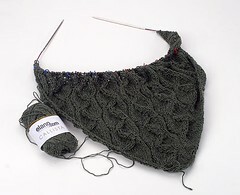 The pattern is a very simple cable, but it's the first cable project I tried so that I could learn how. I think this is much of my problem with flitting from project to project-- I'm so impatient to learn all kinds of techniques that once I know how to do something, I move on to another type of project. I think now, though, I'm getting into a "finishing" phase, which will be a good way to move on to some new projects I've been planning. I've also got a false start of an Elizabeth Zimmermann Baby Surprise Jacket, but I think I'm going to frog that and start it over-- it's only a few rows in, and since I started it and put it down, I have much better colors to use for babies than I did when I was starting from yarn in my stash. After all, even if I would dress a baby in a cream, olive, and black BSJ, not everyone would! I guess I'll have to have some kids of my own if I want to push the non-pastel envelope that far. I'd also like to get some socks going because I've been buying LOTS of sock yarn (can't seem to get enough of it), but I only have one sock going at the moment. I want to try this whole two-at-a-time method, as I think I'm going to be very susceptible to SSS (Second Sock Syndrome). So we'll see if I get some going this week, as well. Well, this is surely long enough for a first blog post! I don't know whether anyone will actually read it, but I'm going to try to make sure to write it so that it's safe for public consumption (except for the people that I will try not to tell about it until they've gotten their knitted gifts safe and sound! ).